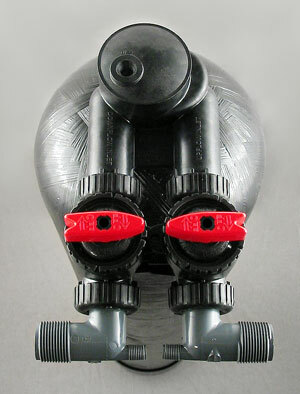 The 10" X 54" system handles service flow rates up to 15 gallons per minute. At right: Shown with bypass installed. A superior water conditioning system that eliminates scale problems without salt, electricity, or the upkeep hassle of water softeners. There are several new water conditioning systems on the market designed to deal with the age-old problem of scale formation in pipes and appliances without the disadvantages (salt usage, upkeep issues, environmental degradation, etc.) 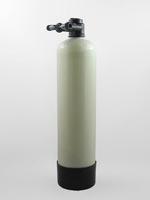 associated with the conventional water softener. Many earlier alternative “softening” systems relied on magnets and a variety of electrical devices to send waves and pulses through pipes in an attempt to rearrange the molecular structure of the water's hardness (calcium & magnesium) ions. The newest in alternative softening devices work differently. 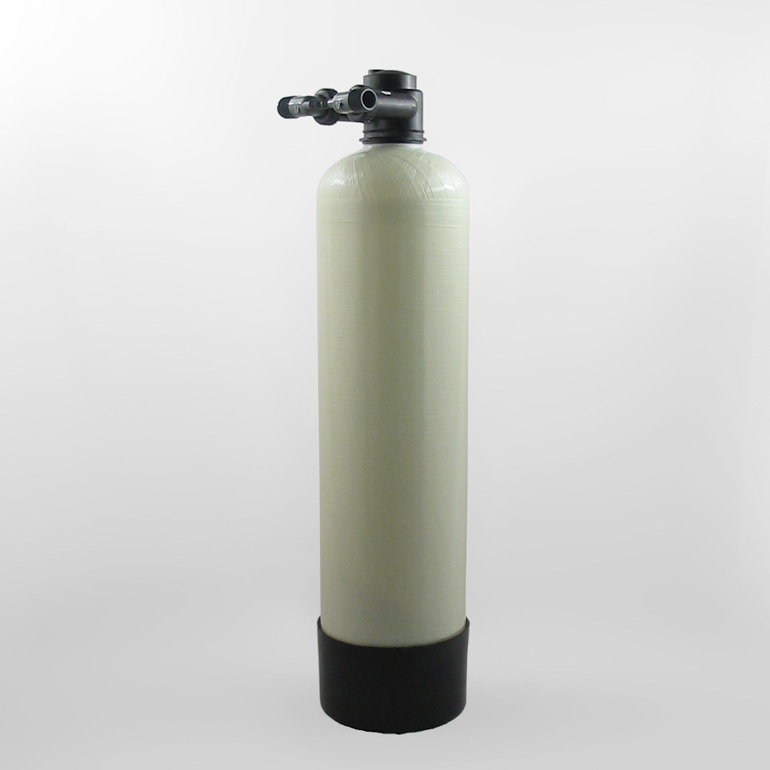 Like the conventional water softener, they use a treatment medium contained in a standard mineral tank. Water is passed through the medium inside the tank and treated. 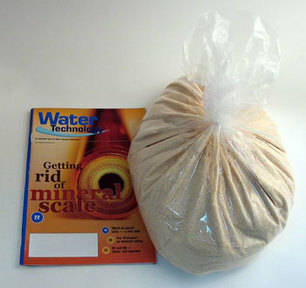 Unlike the softener, however, they do not need to be regenerated with salt and they do not need to connected to a drain. They require no sophisticated electronic control system. They are, therefore, much easier to install and set up. No maintenance, electricity, or salt is needed. The alternative softeners on this page are designed, tested, and built by Watts using OneFlow® anti-scale conditioning medium, a sturdy gravel-free mineral tank, and Clack accessory parts. (Watts previously marketed this product as ScaleNet. ScaleNet and OneFlow are the same product and all parts and media interchange.) This, in our opinion, is the best softener alternative on the market. We are pleased to include it in our product offerings. We recommend the Watts OneFlow system highly for scale prevention. However, we make no claim that this unit will put a smile on your face, make your teeth white, or end your financial worries. We aren't sure, in fact, that it will give you spot-free dishes or that you'll never again have to scrub your toilet bowl. We have seen very impressive results on scale prevention tests done with this unit, however, and we offer it as an excellent way to prevent hardness scale buildup in pipes and appliances and even to remove existing scale. Uses no salt. It's friendly to the environment, your arteries, your pocketbook, and your aching back. Totally acceptable in areas where conventional salt-consuming softeners have been banned or regulated. 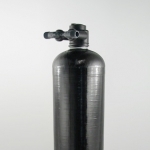 Calcium is not removed from water as it is with a conventional softener, and no sodium is added to your water. Consequently, the “slippery feel” of softened water is not present. The OneFlow system uses a single tank (it needs no salt tank) and does not need access to a drain. Therefore, it saves space and is much easier to install and maintain. Water goes in one side and out the other. The hookup is so simple the installer will be bored with the job. No electricity needed. 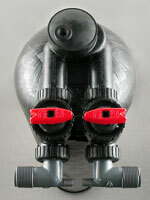 The up-flow conditioner works on water pressure alone. No moving parts. No control valve to program. Nothing to wear out. You experience no noticeable pressure drop because the OneFlow media load is very small and very light. (The largest unit unit needs only about 4 liters of OneFlow media.) Water passes through it easily. Almost totally maintenance free. Life expectancy of the conditioning medium is in years — the exact life depending on usage habits and water quality. Three years is a reasonable expectation for a residential unit. Media replacement is very easy. The units below are designed to operate on reasonably sediment-free water. 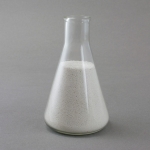 If sediment is present, a sediment prefilter is recommended. We suggest the 5 micron sediment filter listed below, or the equivalent. The OneFlow media is easily damaged by incoming dirt and rust. Iron, petroleum, or hydrogen sulfide in well water must be removed by pre-treatment. OneFlow media life can be shortened by incoming water with an excess of 3 parts-per-million chlorine. (The media will last longer and perform better if no chlorine is present, so a carbon prefilter should be considered for city water use. If installation is made with new copper pipe, the unit may need to be placed in bypass for a time to protect the OneFlow media from excess copper. The products below are standard residential units. Please call for information about larger units. Residential units are designed and sized for standard stop-and- go residential service, not for the long, continuous service runs required in some industrial settings. The standard units will treat water with up to 75 grains per gallon (1275 parts per million) hardness when used in a residential application. If your goal is to eliminate water spotting and discoloration on dishes and metal surfaces we still recommend a traditional water softener. Scale prevention systems are effective at keeping your pipes and appliances scale free, but because the mineral content still remains in the water it often does not improve water spotting issue. We cannot guarantee aesthetic improvements with scale prevention systems. Designed for service flow up to 8 gallons per minute. Includes 2 Liters of OneFlow media. Designed for service flow up to 12 gallons per minute. Includes 3 Liters of OneFlow Media. Designed for service flow up to 16 gallons per minute. Includes 4 Liters of OneFlow media. Scale prevention medium. Eliminates scale problems without salt, electricity, or the upkeep hassle of water softeners. Sold per liter. 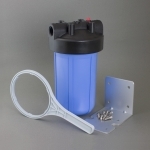 Compact Whole House Sediment filter - 4.5" x 10"
Includes a 10" housing, mounting bracket kit, wrench and a 5 Micron Wound String Sediment Cartridge. At right: OneFlow / ScaleNet load for the 10" x 35" unit. You won't hurt your back lifting. Less than 10 lbs. of the highly concentrated medium is needed. The ScaleNet medium comes factory-loaded and no gravel underbed is needed with the upflow design. It's ready to use. Just connect the unit to your plumbing and turn on the water. No electronic valve to program, no salt to buy. Additional information about the In/Out Design.